Salem is a city in Tamil Nadu state of southern India. Salem is the capital of Salem District. Salem district is surrounded by Dharmapuri district to the north, Villupuram and Perambalur districts to the east, Namakkal district to the south and Erode district to the west. Shevaroys, Yercaud, Sankagiri & Mettur dams are famous tourist places in Salem City. 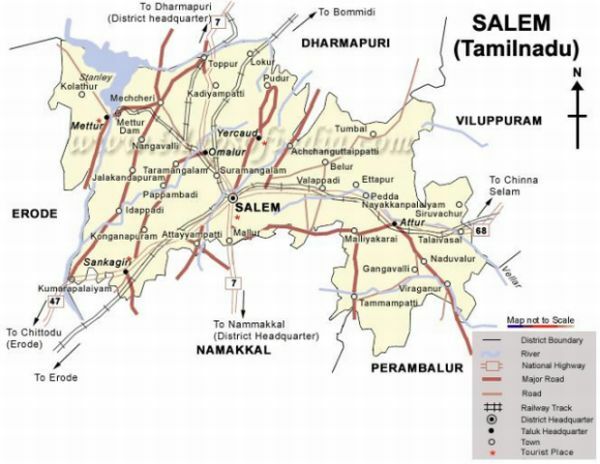 Salem district is well connected by Railway and Road Network in all major cities. Attur, Dharmapuri, Erode, Mettur, Namakkal, Perambalur, Villupuram are located in nearby Salem District. Copyright © 2009. www.Salemcity.com All Rights Reserved.